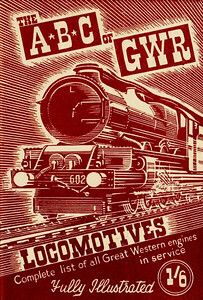 1943 1st edtn - The ABC of Great Western Locomotives, published August 1943, 24pp 1/3, no code. 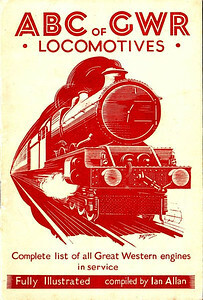 Very basic book, compiled by Ian Allan, using the RCTS GWR book as a reference owing to the inability of the GWR themselves being unable to assist owing to a shortage of staff. Just one photo in this edition - on page 10 is a photo of 6000 "King George V". Plain brown cover with text. No list of running sheds included. 1943 2nd edtn - ABC of GWR Locomotives, published October 1943, 31pp 1/6, no code. 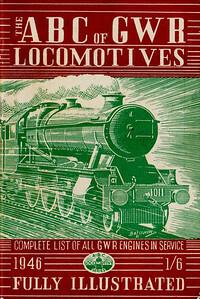 A list of locomotive running sheds with codes appeared in this edition. Some photos in this edition, with a cover drawing of a 'King' Class 4-6-0 by Baldwin. This 2nd edition was reissued in 1982 and reprinted again in 1983 (see Section 012). 1944 3rd edtn - The ABC of Great Western Locomotives, published March 1944, reprinted April 1944, 41pp 1/6, no code. Cover drawing of a 'King' Class 4-6-0 again by Baldwin. See also next photo. 1944 3rd edtn - The ABC of Great Western Locomotives, published March 1944, reprinted April 1944, 41pp 1/6, no code. Cover drawing of a 'King' Class 4-6-0 again by Baldwin. This cover is a totally different shade of brown to that of the previous photo, and I can only assume that one or the other is the reprint of April 1944, but there's no indication of which is which. 1944 4th edtn - The ABC of GWR Locomotives, published July 1944, 41pp 1/6, no code. Again, the cover drawing by Baldwin features a 'King' Class 4-6-0. 1945 5th edtn - The ABC of GWR Locomotives, published January 1945, 40pp 1/6, no code. Another Baldwin drawing of a 'King' Class 4-6-0 adorns the cover. 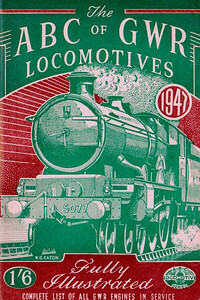 1945 6th edtn - The ABC of GWR Locomotives, published October 1945, 48pp 1/6, no code. Baldwin cover drawing of 'Castle' Class 4-6-0 5041 "Tiverton Castle". 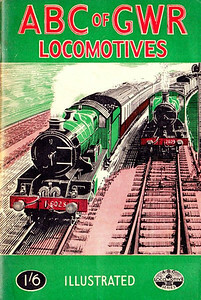 1946 7th edtn - The ABC of GWR Locomotives, published June 1946, 48pp 1/6, no code. Cover drawing by Baldwin of 'County' Class 4-6-0 1011 "County of Chester". 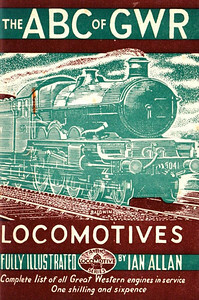 1946 8th edtn - The ABC of GWR Locomotives, published December 1946, 48pp 1/6, no code. The cover drawing, of 'Castle' Class 4-6-0 5077 "Fairey Battle", appears to be signed W G Eaton. 1947 9th edtn - ABC of GWR Locomotives, published June 1947, 48pp 1/6, no code. Printed erroneously as 6th edition (indicated in frontispiece text - see next photo), second printing corrected to read 9th. Cover drawing of 'King' Class 4-6-0 6028 "King George VI" and 2301 Class 0-6-0 2309, is unsigned, but looks like the work of A N Wolstenholme. 1947 9th edtn - ABC of GWR Locomotives, published June 1947, 48pp 1/6, no code. Printed erroneously as 6th edition; frontispiece of original run showing "6th edition." 1947 9th edtn - ABC of GWR Locomotives, published June 1947, 48pp 1/6, no code. This was initially printed erroneously as 6th edition (indicated in frontispiece text - see next photo), this reprint corrected to read 9th edition. Cover drawing of 'King' Class 4-6-0 6028 "King George VI" and 2301 Class 0-6-0 2309, is unsigned, but looks like the work of A N Wolstenholme. 1947 9th edtn - ABC of GWR Locomotives, published June 1947, 48pp 1/6, no code. Originally printed erroneously as 6th edition; frontispiece of reprinted version showing "9th edition." 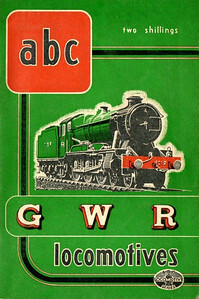 1947 10th edtn - ABC of GWR Locomotives (marked as 7th edition (don't ask, just read the previous four captions! ), published October 1947, 50pp 2/-, no code. This last pre-nationalization edition shared a uniformity in cover design with the other three (SR, LMS & LNER); in this instance, the drawing, by A N Wolstenholme, is of 'County' Class 4-6-0 1019 "County of Merioneth". Two variations of this book; this is the more common, the cover being dark green, The rare edition is bright green (see next photo). 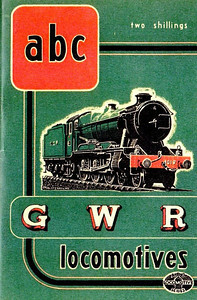 1947 10th edtn - ABC of GWR Locomotives (marked as 7th edition (don't ask, just read the previous five captions! ), published October 1947, 50pp 2/-, no code. This last pre-nationalization edition shared a uniformity in cover design with the other three (SR, LMS & LNER); in this instance, the drawing, by A N Wolstenholme, is of 'County' Class 4-6-0 1019 "County of Merioneth". Two variations of this book; this is the rare bright green edition. The more common version is dark green (see previous photo).